I’m sorry for the Racist past (and present) of the Church. Most of you already know that I write in two places. Here, I write about spiritual growth for followers of Jesus. 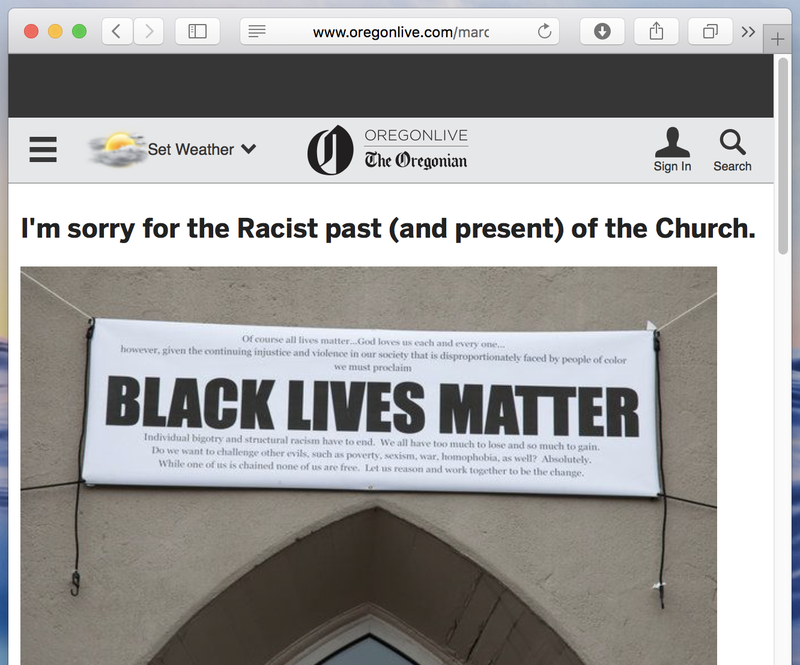 But over at the Oregonian / OregonLive I write to a wider community, here in Portland. I’m in a series that starts with apologies, but is really about a more positive vision for the church’s impact in society. In this 5th post in that series, I highlight one of the biggest shames of the church–our racist past (and sometimes present.) This is much different material than you’ll find here, but I share it in the hopes that it might be helpful. In a recent Facebook post, I shared sadness and shock at a flagrantly racist statement made by a public official. I commented that I didn’t think any Christian could support such a thing. Reading her words, I felt defensiveness rising in me, but nothing she said was untrue. Christians of all stripes have too often used scripture and cultural authority to oppress, even harm people of color. The commenter’s closing words were sharp. “…we might be better off dealing with the fact that racism is part of the lifeblood of the white Christian experience rather than lamenting the overt nature of the reveal.” Ouch.